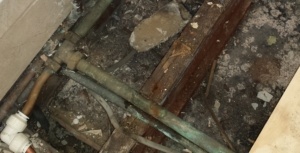 Claiming for a water damage repair after a leak, burst pipe or flood? If you’re claiming for a water damage repair to your property, IC Assist provide a professional restoration service. As water damage specialists, we’re here to help if your home has been damaged by a leak, burst pipe or flood. We not only offer a comprehensive repair and claims solution. But we also have industrial air movers and dehumidifiers to dry out your property. This means we can help with anything from a minor leak to a flood that has damaged every room! When making an insurance claim for water damage, it’s important to get professional assistance from a company like IC Assist. This ensures you get a service tailored to you. It also gives you peace of mind that the most appropriate restoration technique will be applied. Using an experienced restorer will also minimise any disruption and prevent any unnecessary problems occurring later on down the line. FREE water damage survey to establish what repairs are necessary. Why choose a water damage restoration specialist instead of a general contractor? When claiming for a water damage repair to your home, it’s normal for your insurer to ask you to get a couple of estimates. However, getting a water damage estimate from just any contractor is not a good idea. This is because most of them aren’t trained to dry and restore water damaged properties. So they may be an expert in their trade, but they don’t have the knowledge or equipment to deal with water damage buildings. Choosing an inexperienced contractor can lead to big problems. As if they don’t ensure the structure is adequately dry before re-decorating, mould spores may develop and spread in future. If this happens, it could cost thousands of pounds to rectify any damage as a result! This is a cost that your insurer would not cover. However, if you choose IC Assist there’s no need to worry. We will not only check and monitor these levels to make sure they are suitable for the redecoration to be begins. But, thanks to our years of experience in the insurance industry, we also know how to make a successful water damage insurance claim. ✓ Ceilings and walls – plasterboard, plaster, Artex, lath and plaster. ✓ Bathrooms & en suites – from a minor fix to a complete refurbishment. ✓ Kitchens – replacement units doors and worktops or a complete refurbishment. ✓ Flooring – laminate, engineered, solid wood, parquet, vinyl, luxury vinyl tile. ✓ Sub floors – concrete, chipboard, plywood. ✓ Floor & wall tiles – ceramic, porcelain, mosaic, natural stone. ✓ Joists – treatment or replacement. Water damage repairs are the most common type of claim we manage. Water damage is one of the most common reasons home owners claim on their insurance. We’ve been helping policyholders make successful claims since 2011 and have many satisfied clients. The work has varied from minor plastering and decorating, to refurbishing every room following a flood. So, if you need some professional advice when dealing with your water damage house repair, just give us a call. Please take a look through our albums on Facebook, where you can see pictures of escape of water refurbishments we’ve managed. You can also see our customer online reviews and feedback forms that we’ve received over the years. We provide a comprehensive water damage repair and drying service. IC Assist has a complete range of building services designed to take care everything required to return your property to its pre-loss condition. After our initial visit, we’ll meet with your insurer or their Loss Adjuster to agree any necessary strip out. Once we receive their approval to proceed, our contractors will strip out anything that’s ruined or beyond economical repair. We do this before starting the drying process to reduce drying time, allowing repairs to start sooner. After our team discards the wet materials, we can then target dry the surface beneath. 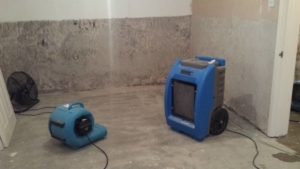 Our air movers and dehumidifiers will then remove any remaining moisture. Once the fabric of your building has reached its per-incident dryness, our specialist contractors will then begin the reinstatement. How long does it take to dry out water damaged walls and floors? Ultimately, this will depend on how saturated the sub-surfaces are. But on average, small leaks can take approximately two weeks to reach an acceptable dryness. However, a burst pipe or flood that has soaked the underlying concrete structure, can take a minimum of one month. In these circumstances, we’ll take weekly meter readings to ensure our equipment is being use to its best effect. When dealing with water damaged properties, we also rely on other essential tools such as our Protimeter and Tramex. Initially they determine how far the water has tracked and how much has been absorbed. This then helps us decide out what needs to be dried, replaced and renewed. We also use them throughout the drying process to check that the moisture levels are sufficiency declining. The full extent of water damage isn’t always visible. There may be problems underneath the surface. Establishing the full extent of destruction caused after an escape of water isn’t as easy as you think. This is because it can hide behind walls, floors and ceilings. When moisture can’t evaporate it will remain trapped and build up. This means that there can be a considerable amount of unseen damage. If you do not address this properly it can affect the underlying structure of your building. Porous materials like plasterboard, insulation, flooring and wood easily absorb moisture. Consequently, floorboards and skirting can swell and warp, wooden floors can buckle and tiles and wallpaper can de-bond. As it travels beneath the surface it pools and saturates things you can’t see. Such as insulation, concrete, joists and the underside of plasterboard. Therefore, the scale of refurbishment will depend on a number of things. From how much water escaped, to how far it tracked and what it damaged along the way. Act quickly to prevent mouldy plasterboard and rotten joists. If you don’t take action promptly after discovering a leak, rot and fungus will grow and spread. Quite often, customers think that only a minor fix is necessary following an escape of water. However, they get a shock when we lift their damaged ceiling or flooring and they see what’s hiding underneath. The picture shows extensive mould growth uncovered whilst carrying out a bathroom floor repair following water damage. 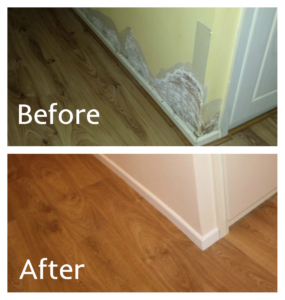 We were called in to help after a leaking push fit ruined the floor tiles, floorboards and kitchen ceiling below. Once we lifted the tiles and sub-floor, the full extent of the damage could then be seen. As you can see, the joists are wet and fungus is growing all over the underside of the ceiling plasterboard. Our specialist team deals this type of destruction all the time. Fixing this problem involves removing sanitary wear in order to remove the saturated sub-flooring. This allows us to fully assess any issues that may be hiding underneath. Where joists aren’t weakened, we’ll dry and treat them before laying a new plywood base ready for the new flooring. Then our plasterer will renew the contaminated ceiling below. However, if they are no longer structurally safe, our contractors will replace them. Is property damage caused by a water leak covered by your home insurance? If you’ve had a leak and are unsure if the repair costs will be covered by your insurance, just give us a call. As, although most standard buildings insurance policies provide cover for sudden or accidental water damage, they do not cover all types. Most polices exclude damage caused by ware and tare and damage that occurred gradually. This means that your claim may be denied if the damage occurred slowly over a long period of time. A lot of claims are declined due to poor maintenance, which can include failed silicone or grout in shower enclosures or around baths. As a result, homeowners can end up having to cover the restoration costs. Not all policies are the same. We will check your policy wording to determine if you are covered. Every policy is different and the circumstances leading to the loss will be unique. That’s why each claim must be assessed individuality to determine if it should be approved. Not only that, but there are exceptions in some polices. For instance, we have come across policies that do not specifically exclude silicone failure. In fact, we were recently called in to help after sealant failed in a shower enclosure. Initially, the Loss Adjuster was looking to decline the claim. However, having checked the customers policy wording, we challenged his decision as there was no specific exclusion for silicone failure. As a result, he authorised the repairs and covered the cost to re-decorate his lounge and en-suite. Important things you should know when making a water damage insurance claim. When claiming for a water damage repair, finding and stopping the leakage is a matter of urgency. This is because, under the terms of your policy, you have a duty to mitigate your claim. Once you stop the water escaping, you also need to prevent unnecessary damage, such as rotten joists or mouldy plasterboard. To avoid this, the strip out and drying process should begin as soon as possible. But don’t worry this is something IC Assist can take care of. Where appropriate, we can install our dehumidifiers and industrial fans straight away. This will prevent rot and fungi developing and allows the repair process to begin sooner. This is why it’s vital to choose a company that specialises in restoring properties affected by water.